Hello friends, this is Newspaper notes for UPSC of 25-06-18, Please do leave your valuable comments , feedback and suggestions, kalyan@iksa.in , telegram: @naylak . Do subscribe to our website and please share this post with your friends. The Indian PM said India and Seychelles will ensure mutually beneficial steps regarding stalled plans for a military base at the island of Assumption. PM announced several initiatives for the strategically located country, including the grant of $100 million Line of Credit for the purchase of defence hardware. “On the project of Assumption island, we have agreed to work for the welfare of each other. The statement is the first from the Prime Minister since the National Assembly of Seychelles last week refused to ratify the naval base that India has been planning to build on Assumption to provide a foothold in the western Indian Ocean. India made it clear that its security and strategic cooperation will go ahead. The National Buildings Construction Corporation (NBCC), tasked with redeveloping half a dozen south Delhi colonies, assured the Delhi High Court that no trees would be cut for the project till July 4. The NBCC and the Central Public Works Department (CPWD) are in the process of felling over 16,500 trees for redevelopment of six south Delhi colonies. The NBCC’s statement came after a vacation Bench of Justices said it was inclined to order an interim stay of the tree-chopping process. Petitioner has sought setting aside of the terms of reference and the environmental clearances granted to the project by the Environment Ministry. NBCC (India) Limited, formerly known as National Buildings Construction Corporation Ltd., is a blue-chip Government of India Navratna Enterprise under the Ministry of Housing and Urban Affairs. Joint Secretary in the Power Ministry said that while it is the Centre’s responsibility to connect households and villages to the power grid or provide them alternative sources of electricity, it cannot guarantee the supply of electricity to them. The actual supply is the responsibility of the power distribution companies ( discoms) in each State. In news: The Centre has claimed 100% electrification of all villages and 83% of all households across the country. It has said that all households will be electrified by the year end. This according to power sector analysts, is because discoms are still very inefficient, with the costs they incur in the transmission far outweighing revenue. F&D: Government data show discoms across the country, on an average, lose Rs. 0.22 a unit of electricity supplied. Power Ministry has claimed that this situation is improving rapidly under the Ujwal Discom Assurance Yojana (UDAY), with Power Minister recently saying that discom losses have drastically reduced to Rs. 17,352 crore in 2017-18 from Rs. 51,096 crore in the previous year. The performance of discoms is improving, they are still not at the performance level to supply electricity 24×7. The first is their financial health. Most of them are not financially capable to do this. If the respective State governments continue to give financial support and assurances to the discoms, then this could definitely improve. What is definition of an electrified village ? According to the definition, in place since October 1997, a village is deemed to be electrified if basic infrastructure such as a distribution transformer and distribution lines are in place in the inhabited locality, electricity is provided to public places like schools, panchayat office, health centres, dispensaries, community centres, and at least 10% of the households in the village are electrified. What are the Ground realities and quality of Power Supply ? The claim of electrification pales when viewed against some of these realities. Rural household electrification has a wide range across States, from 47% to 100%. The average hours of power supplied in a day to rural areas in January 2018 ranged from 11.5 in Mizoram, 14.91 in Haryana and 17.72 in Uttar Pradesh to 24 hours in Kerala, Gujarat and Tamil Nadu. These anomalies are often the result of infrastructure deficits and administrative inefficiency and they show that, even with supportive Central schemes, the Power for All 24×7 goal adopted by States and Union Territories with a deadline of April 1, 2019 is far from realistic. Census data for 2001 and 2011 indicate that the number of rural households that use electricity as their primary source of lighting rose by about 12 percentage points to 55.3%, while in that decade urban households rose five points to 92.7%. The per capita consumption between rural and fast-rising urban India also represents a challenge, since there is a divergence between the two. “Saubhagya” is to ensure electrification of all willing households in the country in rural as well as urban areas. However, un-electrified households not covered under the SECC data would also be provided electricity connections under the scheme on payment of Rs. 500 which shall be recovered by DISCOMs in 10 installments through electricity bill. The solar power packs of 200 to 300 Wp with battery bank are provided for un-electrified households located in remote and inaccessible areas. India is considering jointly bidding for oil blocks in the UAE with companies based there, Petroleum Minister said. The Minister also said that India would consider leasing a part of its third strategic reserve in Padur if Abu Dhabi National Oil Company (ADNOC) was interested. It had already leased a part of the strategic reserve in Mangalore to ADNOC. The MoU signed by Saudi Aramco and ADNOC was to jointly develop and build an integrated refinery and petrochemicals complex at Ratnagiri in Maharashtra. The project would be implemented by Ratnagiri Refinery & Petrochemicals Ltd. (RRPCL). The investment by Saudi Aramco and ADNOC in the $44 billion project will be the highest ever overseas investment in the Indian refining sector. The significance, however, goes much beyond FDI. It is a strategic partnership between India, Saudi Arabia and the UAE which is symbolised by the MoU. The strategic partnership brings together crude supply, resources, technologies, experience and expertise of these multiple oil companies with an established commercial presence around the world. The Ratnagiri refinery would be capable of processing 1.2 million barrels of crude oil per day or 60 million metric tonnes per annum. It would produce a wide range of refined petroleum products, including petrol and diesel meeting BS-VI fuel efficiency norms. To ensure energy security, the Government of India had decided to set up 5 million metric tons (MMT) of strategic crude oil storages at three locations namely, Visakhapatnam, Mangalore and Padur (near Udupi). These strategic storages would be in addition to the existing storages of crude oil and petroleum products with the oil companies and would serve as a cushion during any external supply disruptions. The crude oil storages are constructed in underground rock caverns and are located on the East and West coast of India. Crude oil from these caverns can be supplied to the Indian Refineries either through pipelines or through a combination of pipelines and ships. Underground rock caverns are considered the safest means of storing hydrocarbons. The country will need more than $4.5 trillion in investments over a decade to create infrastructure but the cost of such investments will be a challenge, Finance Minister said at the Asian Infrastructure Investment Bank’s (AIIB) annual meeting. Interest rates are rising globally as well as domestically, raising the cost of finance,FM said. India is the second-highest equity investor in AIIB and also the largest recipient of funds from the multilateral agency that started operations in January 2016. India has picked up 28%, or $ 1.4 billion of the AIIB’s total funding for seven projects. Finance Minister said the country is looking forward to investments in nine more projects with a funding of $2.4 billion from AIIB. AIIB approved an equity investment of $100 million in India’s National Investment and Infrastructure Fund’s (NIIF) and is considering a further investment of $100 million in the future. Asian Infrastructure Investment Bank (AIIB), a multilateral development bank with a mission to improve social and economic outcomes in Asia and beyond. Headquartered in Beijing, it commenced operations in January 2016 and have now grown to 86 approved members from around the world.It has authorized capital of US 100 billion dollars and subscribed capital of USD 50 billion. It offers sovereign and non-sovereign finance for projects in various sectors with an interest rate of London Interbank Offered Rate (LIBOR) plus 1.15 % and a repayment period of 25 years with 5 years in grace period. Oil India Limited (OIL), one of India’s largest public sector oil exploration and production companies, has made its second hydrocarbon discovery in the onland KG Basin NELP VI Block. OIL is the operator of the the block with 90% participating interest while the balance 10% is held by Geo Global Resources. Maharashtra’s ban on several consumer articles made of plastic, introduced after a three-month notice period to industry and users, is an extreme measure. It is naturally disruptive. Today, stemming the plastic tide is a national imperative. India hosted this year’s World Environment Day and Prime Minister made a high-profile pledge, to international acclaim, that it would do away with all single-use plastics by 2022.This goal is not yet backed by an action plan so that State governments and local bodies can be in sync. Worldwide, the problem has got out of hand, with only 9% of about nine billion tonnes of plastic produced getting recycled. If the Centre and the States had got down to dealing with the existing regulations on plastic waste management and municipal solid waste, a ban would not even have become necessary. Specifications for the recycling of different types of plastics were issued two decades ago by the Bureau of Indian Standards. To address the global concern that the bulk of India’s plastic waste estimated officially at 26,000 tonnes a day is being dumped in the oceans, there has to be an effort on a war footing to segregate it at source. But segregation at source has not taken off, as there is little awareness, official support or infrastructure. Even bulk generators such as shopping malls, hotels and offices do not abide by the law. The Urban Development Secretary in each State, who heads the monitoring committee under the rules, should be mandated to produce a monthly report on how much plastic waste is collected, including details of the types of chemicals involved, and the disposal methods. Such compulsory disclosure norms will maintain public pressure on the authorities, including the State Pollution Control Boards. Priority, therefore, should be given to stop the generation of mixed waste, which prevents recovery of plastics. Companies covered by extended producer responsibility provisions must be required to take back their waste. In parallel, incentives to reduce the use of plastic carry bags, single-use cups, plates and cutlery must be in place. Retailers must be required to switch to paper bags. Plastics became popular because they are inexpensive, can be easily produced and offer great convenience. But, as the UN Environment Programme notes, their wild popularity has turned them into a scourge. Consumers will be ready to make the switch, but they need good alternatives. Recep Tayyip Erdoğan’s re-election as President of Turkey comes as no surprise. With this, his authoritarian grip will be further consolidated; in the new term, he will acquire the sweeping executive powers given to the presidency through last year’s referendum. The elections were held in a state of emergency, imposed in July 2016 following a coup attempt. A faltering economy, characterised by plunging foreign direct investment, high inflation and a depreciating lira, had given the Opposition some hope of taking the fight to Mr. Erdoğan. But the President’s polarising personality and his party’s wide organisational reach, coupled with the perception that he was the right person to revive economic growth, helped him retain power. His victory is likely to see Turkey continuing with its belligerent role in the West Asian neighbourhood. A stable, democratic and pluralist Turkey is essential in a neighbourhood that continues to be blighted by ethnically driven civil wars. As things stand, Mr. Erdoğan’s victory signals another hyper-nationalist, authoritarian turn. Personal Note: I humbly accept the defeat when it comes toShiv Visvanathan articles, it’s beyond me to simply put the articles in a summary format.He compares the mob lynching in Hapur in Uttar Pradesh to A Hindu woman and a Muslim man get isolated in a temple. The mob drags the man out, hitting him at random. A policeman stands up to the mob. Then the author goes on verbosely to attack the mind of the reader. Here are few lines in my opinions which convey the crux of the article. The policeman too can merge into the background and play the spectator indifferent to spectacle.The victim, by the very label Dalit, Muslim or woman, is the only social category; the scapegoat marked for violence. The indifference of the police in the video appears both surreal and slapstick. It spooks justice, the concept of duty, the Constitution as they let the violence go on. The fable asks, who is the stranger, the other? It answers, the other is an extension of the self. Society, it argues, cannot be made of similarity and uniformity but it crucially needs difference and the celebration of difference to keep society alive. As the South African philosopher A.C. Jordan advised, “One needs to reinvent the stranger constantly to keep society alive.” Gagandeep Singh, the policeman at Ramnagar, plays the good Samaritan. At a time when police brutality is at its prime as in Thoothukudi, Tamil Nadu, the policeman and the citizen become “others” to each other. To this we add the distance between a fundamentalist mob and its victim. When a policeman like Gagandeep Singh rescues a victim, the fable of the Good Samaritan is enacted once again. The first picture, from Hapur, displays the standard indifference of society to its other. Citizenship and authority come alive when the other becomes part of the creative self. Society in this fable is born when one creates civility. Gagandeep Singh’s act shows that society has to care to continue. The two pictures become ‘before’ and ‘after’ pictures of one narrative. It is up to us as seekers of meaning to read it. One exemplary act shows what is possible with a bit of courage and a touch of patience. The policeman protects the victim but does nothing to imitate the crowd. It is also a reminder that a social contract does not come alive because of formal rules. It comes alive when someone is ready to sacrifice for it. Development is about expanding the capabilities of the disadvantaged, thereby improving their overall quality of life. Based on this understanding, Maharashtra, one of India’s richest States, is a classic case of a lack of development which is seen in its unacceptably high level of malnutrition among children in the tribal belts. While the State’s per capita income has doubled since 2004 (the result of sustained high economic growth), its nutritional status has not made commensurate progress. Though stunting has declined from 46.3% to 34.4%, wasting rates have increased from 16.5% to 25.6%. Further, the underweight rate (36%) has remained static in the last 10 years. This is worse than in some of the world’s poorest countries Bangladesh (33%), Afghanistan (25%) or Mozambique (15%). This level of poor nutrition security disproportionately affects the poorest segment of the population. According to NFHS 2015-16, every second tribal child suffers from growth restricting malnutrition due to chronic hunger. In 2005, child malnutrition claimed as many as 718 lives in Maharashtra’s Palghar district alone. In September 2016, the National Human Rights Commission issued notice to the Maharashtra government over reports of 600 children dying due to malnutrition in Palghar. Stunting is caused by an insufficient intake of macro- and micro-nutrients. It is generally accepted that recovery from growth retardation after two years is only possible if the affected child is put on a diet that is adequate in nutrient requirements. A critical aspect of nutrient adequacy is diet diversity, calculated by different groupings of foods consumed with the reference period ranging from one to 15 days. calculating a 24-hour dietary diversity score by counting the number of food groups the child received in the last 24 hours. The eight food groups include: cereals, roots and tubers; legumes and nuts; dairy products; flesh foods; eggs; fish; dark green leafy vegetables; and other fruits and vegetables. And 26% and 57% of the children (83% put together) had a dietary diversity score of two and three, respectively, implying that they had had food from only two/three of the eight food groups. In most households it was rice and dal which was cooked most often and eaten thrice a day. Only 17% of the children achieved a minimum level of diet diversity — they received four or more of the eight food groups. Such acute food insecurity in tribal households is due to a loss of their traditional dependence on forest livelihood and the State’s deepening agrarian crisis. Besides these, systemic issues and a weakening of public nutrition programmes have aggravated the problem. For example, 20% of tribal families did not receive rations (public distribution system) in Vikramgad (in Palghar) as they did not have a card. Way forward: It is time the government looks at the root cause of the issue and finds a sustainable solution for tackling malnutrition. This is possible only when the state focusses on inclusive development by creating employment opportunities for the marginalised which would improve their purchasing power and, in turn, reduce malnutrition. These indicators are used to measure nutritional imbalance resulting in undernutrition (assessed from underweight, wasting and stunting) and overweight. Child growth is internationally recognized as an important indicator of nutritional status and health in populations. The percentage of children with a low height for age (stunting) reflects the cumulative effects of undernutrition and infections since and even before birth. This measure can therefore be interpreted as an indication of poor environmental conditions or long-term restriction of a child’s growth potential. The percentage of children who have low weight for age (underweight) can reflect ‘wasting’ (i.e. low weight for height), indicating acute weight loss, ‘stunting’, or both. Thus, ‘underweight’ is a composite indicator and may therefore be difficult to interpret. What are the consequences and implications? Underweight: As weight is easy to measure, this is the indicator for which most data have been collected in the past. Evidence has shown that the mortality risk of children who are even mildly underweight is increased, and severely underweight children are at even greater risk. Stunting: Children who suffer from growth retardation as a result of poor diets or recurrent infections tend to be at greater risk for illness and death. Stunting is the result of long-term nutritional deprivation and often results in delayed mental development, poor school performance and reduced intellectual capacity. This in turn affects economic productivity at national level. Small women are at greater risk of delivering an infant with low birth weight, contributing to the intergenerational cycle of malnutrition, as infants of low birth weight or retarded intrauterine growth tend be smaller as adults. Wasting: Wasting in children is a symptom of acute undernutrition, usually as a consequence of insufficient food intake or a high incidence of infectious diseases, especially diarrhoea. Wasting in turn impairs the functioning of the immune system and can lead to increased severity and duration of and susceptibility to infectious diseases and an increased risk for death. Overweight: Childhood obesity is associated with a higher probability of obesity in adulthood, which can lead to a variety of disabilities and diseases, such as diabetes and cardiovascular diseases. The risks for most noncommunicable diseases resulting from obesity depend partly on the age at onset and the duration of obesity. Obese children and adolescents are likely to suffer from both short-term and long-term health consequences, the most significant being: cardiovascular diseases, mainly heart disease and stroke; diabetes; musculoskeletal disorders, especially osteoarthritis; and cancers of the endometrium, breast and colon. The 15th Finance Commission (FC) is in the process of figuring out a fair formula for the distribution of net tax proceeds between the Union and the States, and among States. The 14th FC had adopted a formula-based tax devolution approach, apart from grants-in-aid for local bodies, disaster relief, and post-devolution revenue deficit grants. The share of devolution to the States was enhanced to 42% from 32%, which gave the States considerable flexibility. However, it dispensed with sectoral grants for elementary education, the forest sector and renewable energy sector, among others. The devolution formula, therefore, is central to the approach of resource transfers. The 14th FC accorded 27.5% weight to the population (of which 17.5% was of the 1971 population), 15% to area, 7.5% to forest cover and 50% to income distance. Larger States with larger populations have a greater requirement of resources. Income distance was adopted as a proxy for fiscal capacity, and forest cover was given weightage for the first time, underscoring ecological benefits. The Northeast represents a distinct entity for developmental planning and has a special category status. Low levels of human development indices, a low resource base, and poor connectivity and infrastructure pose a different challenge which must be taken into account in the devolution formula. Central Ministries earmark 10% of their allocations for the Northeast. By the same logic, 10% of tax proceeds could be earmarked for vertical devolution to the region. The 13th FC acknowledged the different position of the Northeast while arriving at the formula for horizontal devolution. Its twin guiding principles were equity and efficiency. It accorded 47.5% weight to fiscal capacity distance. The Northeast also bears a disproportionate burden of natural disasters every year on account of rainfall. The 14th FC disaster relief grants bore no correlation with vulnerability but were ad hoc extrapolations of previous allocations. The Energy and Resources Institute has computed an index of vulnerability of all States. The disaster vulnerability index is highest for the Northeast; this needs to be factored in while allocating grants. The region also has the highest forest cover and represents the largest carbon sink nationally. Allocating 10% for forest cover would encourage States to preserve the forests. The Terms of Reference of the 15th FC also mention performance-based incentives based on improvements in GST collection, Direct Benefit Transfer rollout, etc. This would definitely infuse a spirit of competition. However, the performance of the Northeastern States must be benchmarked with other Northeastern States so that apples are not compared with oranges. But who is to decide how this divisible pool of revenue is to be shared between Centre and states? A neutral umpire is required. The Constitution designates the Finance Commission (FC) as that umpire. The FC must perform a tough balancing act. If allocation to the states is disproportionately small, there is risk that expenditures on education, health and local infrastructure, which must be substantially locally provided, will go underfunded. Equally, if allocation to the Centre is unduly small, national public goods such as defence, internal security, highways, waterways and railways may go underfunded. The 14th FC had felt that time had come to shift the allocation of the divisible pool in favour of states for two reasons. First, grants made by the erstwhile Planning Commission to the states – approximately 7% of the divisible pool – belonged to the states and should go to them unconditionally. Second, greater freedom of expenditures on education, health and local infrastructure needed to be given to states. Accordingly, it raised the direct devolution to states from 32% to 42% of the divisible pool. in the terms of reference (ToR) to the 15th FC, it has taken the unprecedented step of directing the latter to consider the impact of the enhanced devolution on its fiscal situation. The 15th FC now has the unenviable task of deciding whether to reverse the course charted by its predecessor. The ToR also direct the 15th FC to use population data of 2011 instead of 1971 in determining each state’s share. The directive has led to a heated debate with critics arguing that it punishes the southern states for early success in lowering fertility rates to replacement levels. The ToR direct the 15th FC to propose performance-based incentives in a number of areas such as deepening tax base, achieving replacement level fertility rates and implementing flagship schemes of the Centre. The FC can surely offer advice on how performance in these areas may be measured to guide the Centre’s own performance-based incentives out of its budget. 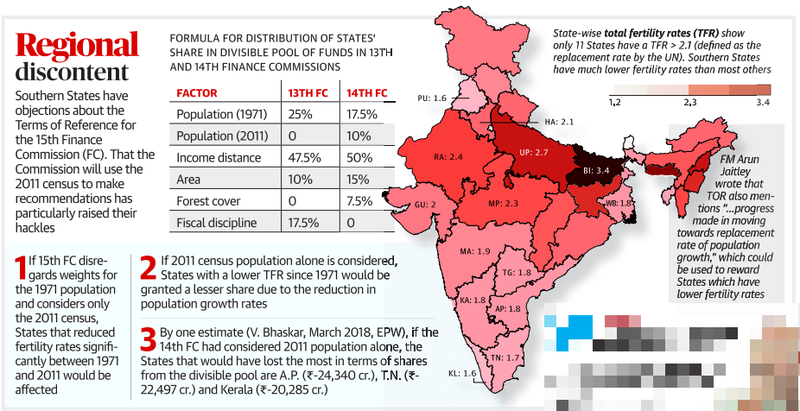 Background: In November 2017, the 15th Finance Commission (Chaired by Mr N. K. Singh) was constituted to give recommendations on the transfer of resources from the centre to states for the five-year period between 2020-25. The Finance Commission is a constitutional body formed every five years to give suggestions on centre-state financial relations. Each Finance Commission is required to make recommendations on: (i) sharing of central taxes with states, (ii) distribution of central grants to states, (iii) measures to improve the finances of states to supplement the resources of panchayats and municipalities, and (iv) any other matter referred to it. This, it is feared, will mean that the shares of states more successful in controlling their population will decrease, while those who couldn’t control their population will get a larger share. As a result, southern states could lose the most, while some in the north would gain. This does not, however, mean that the entire amount to be disbursed is based on the population – only a certain percentage of the funds. In the case of the 14th Finance Commission, that was 25%. Some of the other factors that the Commission takes into account are percapita income, area, and fiscal discipline. F&D: Facts and data which can be used in your mains answer writing. Pre: Prelims related Home work /Things to do and remember . Thank you sir.. Its very helpful..
Its really a nice, structured and Dr detailed description. Thank you, glad you like it . Please share it with your friends. Thank you so much for providing newspaper notes ,it is very helpful. I really appreciate your effort thank you. Thank you , Please do spread the word about our Newspaper notes Initiative. Thank You sir for your valuable service. Glad to be of help. please spread the word about our efforts. Thank you. Very concise . smooth for encapsulation.